Collaborative Geriatrics of Katy, TX is the first LTPAC medical practice I know that’s received the CMS designation as ‘High-Quality’ under its Value Based Purchasing scheme. There are many medical groups that deliver high quality care, but that is fundamentally different than having the organizational ability to successfully report quality measures across the group, and receive a high score. CGI is a 23+ Nurse Practitioner group founded & led by Rhonda Hunsucker, A/GNP, and managed by Jean McQueen Butcher, MBA. The practice covers dozens of Nursing Facilities in their community. Prior to CGI, each of these executives had worked in other large Houston LTPAC medical practices. The arc of their careers, and the profile of their practice, is found in hundreds of other medical groups – objectively, it’s hard to identify any inherent advantage that led CGI to their outstanding performance. What sets CGI apart from others is an acknowledgement that CMS was moving towards performance scoring – and accepting that learning its rules was important to future success. Jean simply refers to the process as ‘exercising the reporting muscles’. Like any exercise, the hardest part is getting started. Once you are moving, it’s less painful than imagined. CGI’s leadership recognized that all CMS Quality Measures are not created equal; each measure has an intrinsic ‘value’ which is embodied by its benchmark (a national benchmark assigned by CMS). Practices have latitude in selecting quality measures. The key to success is identifying, and reporting on, quality measures with low benchmarks. Measures with low benchmarks, when reported at a high-performance rate, will yield a high-performance score. Conversely, measures with high benchmarks yield a low performance score even when reported at a 100% performance rate. After selecting a base quality strategy for 2016 which satisfied PQRS requirements, CGI added selected individual measures which added significantly to their Standardized Performance Score. That wise selection yielded a combined Quality Score that was above 1.0, the threshold for the ‘High Quality’ designation. This same process, with modifications, is the core strategy for managing the MIPS reporting process. LTPAC groups with good reporting skills, and reasonable determination, can achieve MIPS scores of 70 to 100 and be in line for whatever bonus payments are available. Caution – beyond this point the reading gets very difficult! I’m explaining a strategy for Reporting Quality Measures that earn High Quality Scores; a distinctly different activity than providing High Quality Care. Nothing about a strategy to Earn a high score is simple, or easy to understand, because the CMS designs for VBP and MIPS are defective. Key Point #1 – there are no CMS approved Quality Metrics designed for use in or by LTPAC medicine. Regardless, anyone working under the traditional Medicare Part B fee-for-service program is required to select and report Quality Measures [QMs]. Groups that do not report Quality Measures are penalized; groups that satisfy minimum reporting requirements receive payments adjusted which/that are determined by CMS. Adjustments can be negative or positive – depending on a calculated score. We are going to discuss how CGI’s leadership identified and executed a quality reporting strategy that earned a high score for 2016 – that remains a key skill under MIPS for 2017 & 2018! When LTPAC Groups first received QRURs for 2012, they were all classified as ‘High Cost’; I recall publishing my first blog post on the topic in October, 2013. It was apparent then, and is now – CMS’ statistical models for its quality and cost analyses are wrong. CMS announced its plans for VBP as early as 2012, with final rules published in 2014 for CY 2015 reporting. They applied to most physician-led medical groups – with payment adjustments beginning in 2017. If you accept my assertion that all LTPAC medical groups are ‘high cost’ under VBP, then the only remaining variable is quality. The following table shows the 2017 payment adjustments for larger physician-led groups, based on 2015 data. CGI embraced the quest for achieving ‘high quality’ during 2016 to avoid the negative payment adjustment for being ‘high cost’ and ‘average quality’. Here is how they reached their objective. More than 50% of the organization’s medical staff had to satisfy requirements for successfully participating in PQRS. Then, each Quality Measure was ‘scored’ against a CMS established benchmark. Quality Measures were assigned to ‘domains’. If a domain contained more than one ‘scored’ quality measure, the measures’ scores were averaged, and the result was the domain’s score. Some domains were populated with QMs calculated by CMS from claims. Those measures quantified hospitalization and rehospitalization rates. Patients in nursing homes are always frail, elderly, and burdened with multiple chronic conditions. That population has a measurably greater hospitalization/rehospitalization frequency than individuals of comparable ‘acuity’ living in community settings. The result was a low (negative) standardized performance score in the communications and care Coordination Domain. The domain with hospitalization-related QMs had low scores; in the case above that score was <-2.69> (average of -4.44, -1.18, & -2.46) – which dragged down the group’s overall average quality score. Again, this is a problem with bad benchmarking – not bad care. The readmission rate compared all SNF Part A readmissions against a national benchmark of community based primary care. Adopt an active reporting plan/strategy that makes it possible to ‘win’, and still offers great training if you fall short. Eureka moments still exist! A key Insight opened the door to CGI’s ‘high quality’ score under VBP. CMS rules for VBP quality reporting gave practitioners/practices hundreds of reporting options; all measures are not created equal for all situations – choose wisely. For CY 2016, PQRS and VBP calculations were based on a full year’s reporting. However, if the group elected to report individually using a PQRS Measures Group, individuals’ requirements were satisfied with just 20 patient reports (11 of them Medicare B). CMS Regulations allowed individuals to submit additional individual quality measures; if those individual measures included 20+ patients, the measure would be included in the Group’s VBP Quality Score calculation. (e.g. #332 – Adult Sinusitis. Valid exclusions include: organisms resistant to Amoxicillin, recurrent and chronic sinusitis). These individual patients count towards the threshold reporting requirements, but they are being excluded when testing if the Quality Measure contributes to the Performance Score. After I left my own LTPAC Medical group to lead GPM, it hired a Quality Manager, who had an original insight – CMS Calculated three quality measures from hospitalization/rehospitalization rates [CMS 1, 2, & 3]. All three were assigned to the ‘Communication and Care Coordination’ domain. #0110 – Influenza Immunization. For 2016, a 100% performance rate earned +2.07 Quality Points. We presented the ‘high quality’ strategy at the Fall 2015 gEHRiMed™ Users Group meeting. CGI’s leadership participated, and volunteered to test the model during 2016. Their ‘test’ was successful and resulted in the ‘High Quality’ Score. 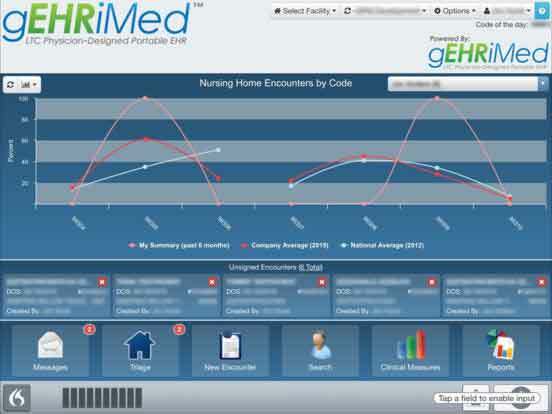 Motivate your Clinical and Back Office staff – get buy-in, and regularly monitor performance. At the beginning, we stated that CGI’s leaders were determined. Jean Butcher adapted the plan for CGI; then Rhonda Hunsucker embraced it as part of CGI’s organizational strategy and championed it to her clinical colleagues. Throughout the calendar year Jean periodically monitored the performance reports of each clinician. Clinicians whose performance fell below the required reporting frequencies, or whose Performance Scores were below 100%, were reminded of the group’s goals high performance goals. Jean and Rhonda repeated that achieving high performance for all staff was not insurmountable, but it did require commitment by management, and regular monitoring and feedback to demonstrate the activity’s importance to the Practice. Waiting for Results is Frustrating – Jean, and many others, say that the difficult part of Quality Reporting is the lack of timely and meaningful feedback. The results from 2016 weren’t received until the end of September 2017. That is a fundamental shortcoming of these programs, which CMS acknowledges. The next Blog in this series on CMS quality program participation will discuss how this successful VBP strategy can translate into one applicable to MIPS (the merit-based incentive payment system).